EquaPly 2 ply backing is ideal for applications requiring stability and greater strength than paperbacked veneers. EquaPly bonds a rotary whole piece cross-wood back to the face veneer, forming a very stable two-ply wood on wood sheet. EquaPly remains pliable and easy to work with, while adding far greater strength. 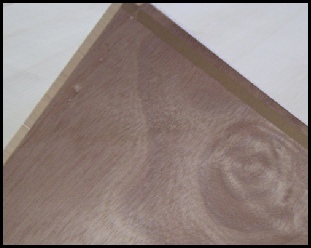 The cross-wood back is similar in color to the face veneer, which eliminates possible tinting of the face. This similar color back also makes it difficult to visually separate the face and back when seen in profile. EquaPly resists warping due to temperature and humidity changes that would make paperbacked veneer curl, shrink or expand resulting in checks and cracks in the veneer. It is also an excellent choice for bonding with contact cement. The added thickness provides a better moisture barrier preventing finish bleed-thru that can result in glue to reactivation and releasing.